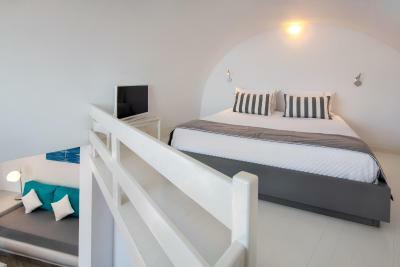 Lock in a great price for Apanemo Hotel & Suites – rated 9.4 by recent guests! Beautiful property with very attentive staff. The included breakfast was above and beyond. The service was fantastic! The gentlemen at the front desk patient, accommodating and personable. Great breakfast food and beautiful hotel layout. Beautiful facilities and incredibly friendly and helpful staff. Staff went the extra mile to drive us into town to the nearest bus stop and even drove us to dinner at a nearby taverna. All about Apanemo was great, gorgeous view, people in the hotel so sweet, breakfast very nice and variety, they help you with everything. I definitely comeback again, and recommend the lovely place. Loved the view, staff goes above and beyond to offer best service, breakfast is fantastic and the rooms are clean and crisp. The staff were very friendly and helpful at all times. The hotel was impeccably clean and the views were amazing! Excellent hotel! The staff were really friendly and service was excellent. Great location. Close to black beach and nice places to eat. The property was so comfortable! The pool and view were amazing! I stayed there most of the day and really enjoyed it. My room was very clean, had an ocean view and was pretty spacious. The staff were very hospitable and the breakfast was delicious! 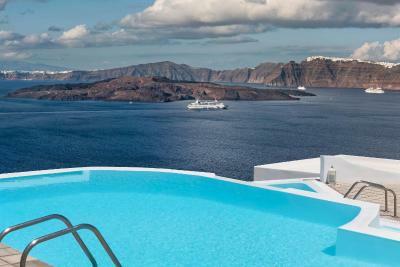 I like that the hotel is away from the crowds of Fira and Oia. It is close to the beach. They shuttle you to the nearest bus stop which makes it very convenient to get to both towns as well as the red beach! When you return, all you have to do is call them and they will pick you up! 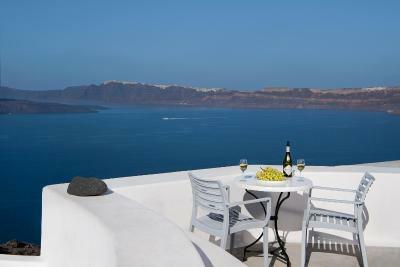 When I return to Santorini, I will definitely return to Apanemo! The staff was amazing, from the cleaning lady to Spiro's the Manager, everyone bent over backwards to help in anyway possible with anything we needed. Hotel is isolated and relaxing. We rented a scooter for easy traveling and parking throughout the island. 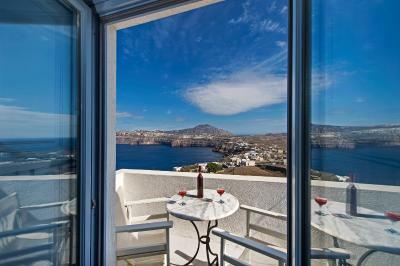 "Apanemo" is a traditional village-style apartment complex, recently renovated and built facing the Caldera, the volcano and the deep blue Aegean Sea. 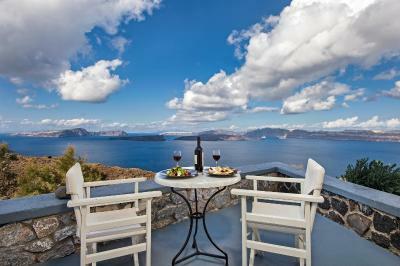 The complex is in Akrotiri, on the unspoiled side of the island of Santorini. 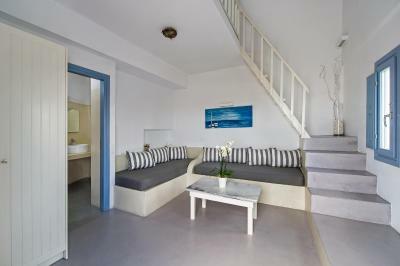 It is only 5 minutes from the archaeological town and close to the famous red beach. There is a 3-level swimming pool and a children’s pool, as well as a breakfast room providing continental breakfast, and private parking. Guests are invited to enjoy a memorable vacation in a friendly and hospitable family environment. 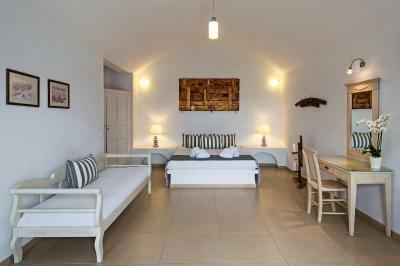 The traditional architecture and furniture, in combination with friendly service, promises an unforgettable stay. 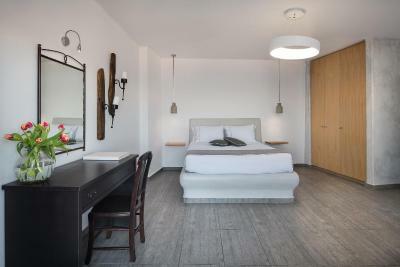 When would you like to stay at Apanemo Hotel & Suites? This room features a balcony with a sea and garden views. 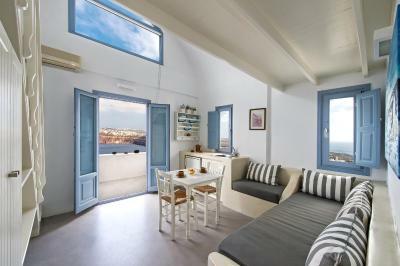 This apartment offers Aegean Sea and caldera views. 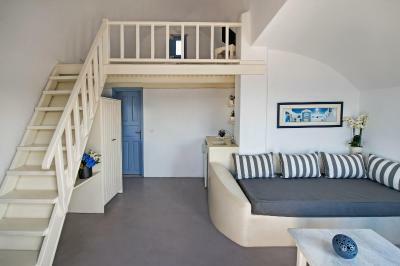 This split-level apartment enjoys Aegean Sea views. 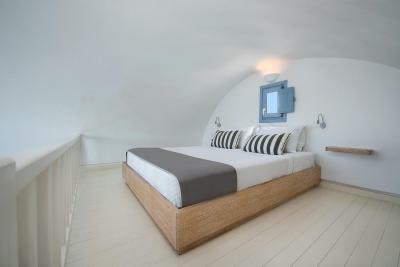 This superior room enjoys Aegean Sea, volcano and Caldera views. 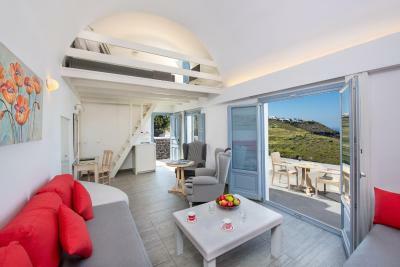 This double room features a balcony with Caldera view, air conditioning and mini-bar. 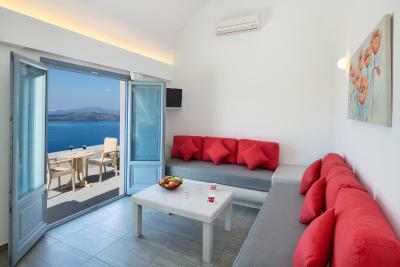 House Rules Apanemo Hotel & Suites takes special requests – add in the next step! Apanemo Hotel &amp; Suites accepts these cards and reserves the right to temporarily hold an amount prior to arrival. Apanemo Hotel & Suites accepts these cards and reserves the right to temporarily hold an amount prior to arrival. Please inform Apanemo Hotel & Suites of your expected arrival time in advance. You can use the Special Requests box when booking, or contact the property directly using the contact details in your confirmation. Very cold one night (October) and could have done with more bedding, probably would have been provided if we asked. A few drawers would have been helpful. Linen and some fittings looking a little tired. Great views, good breakfast, helpful and friendly staff, attractive design. We liked the location, not too busy. Beautiful views and very friendly staff. Free local shuttle services to Red Beach and local restaurants. Our flight was in the evening and we were allowed to stay longer than the normal check out time which we appreciated a lot. The room was damp in the evenings, so it felt cooler than it was. And with there not being a heater we had to request extra blankets which worked out just fine. The pool was beautiful but not heated so we were unable to use it due to cooler weather. The hotel provided a shuttle to places around akrotiri which was fantastic, but there was nothing within walking distance which was the downside. The location was perfect, the setting amazing and the staff were ever so helpful. It’s a really lovely place to stay and they also offer a free taxi to take you to local points of interest (restaurants/shops/attractions). Staff were excellent and happy to help with anything needed. The location was beautiful and quiet, while the hotel had a shuttle bus to get you to the surrounding areas and back from them too. It was a great pleasure to stay there for the few days. We also fell in love with the beautiful cats that were around there. Staff were amazing, friendly and helpful. Infinity pool and view were spectacular. Exceeded our expectations. 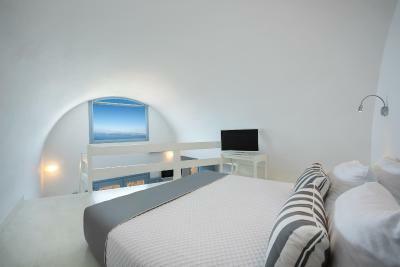 Bed beds, sparkly clean rooms and the most amazing views. Unbeatable views. Stunning infinity swimming pool. The best breakfasts we had in six weeks of travel. Amazing service from all staff. Highly recommend. All the staff are so friendly and keen to help. The cleanliness is excellent - particularly the room! Breakfast spot on. Beautiful location and great service. 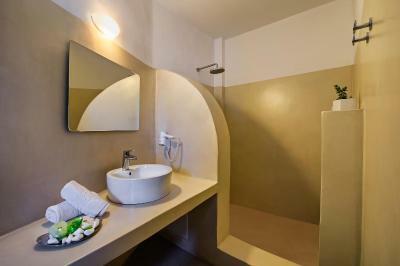 The room was spacious, spotlessly clean and included all the comforts and amenities to make for a pleasurable stay! The view from the pool area was breathtaking! The breakfast terrace is a great place to start your day! The breakfast itself was perfect - full of Greek and European delicacies! Overall, perfect experience for us. We thank the lovely, attentive, kind, communicative and welcoming staff! Very windy and pool unheated so we couldnt use it. Would be better even heating one of the three pool areas. The view from the pool area and the pool was the main reason we booked this place rather than others in the area so was a big disappointment when we discovered it was unheated. Bar and restaurant closed at 1700. Room facilities were great. Bathroom in particular. Sheltered patio area as our room faced away from the Caldera. Staff very friendly. Isabel in particular who was always smiling and happy. Breakfast spread was vast and each item delicious (thanks Isabel!). Free taxi service which was a great advantage due to the location. Is not what a didn't like but what can improve. The food is amazing but is very sad that they stop to serving after 17. And didn't have a long mirror, besides this was perfect.